We had not been camping since Christmas 2015, so we planned to do a shortish trip over the Australia Day period in January 2017. Australia Day was on Thursday, so like alot of people, we planned to be away from the Wednesday through to the next Monday. As usual, we were going with our friends Ron and Donna in their Toyota Prado 120 series and Kelly and I in our 1999 Toyota Prado 90 series. As we have been getting some work done on our house, we can not leave till after a bit of this is complete. This is because I had to pull our boat up out of the driveway last night so that the fence could be resprayed. This is completed by about 11 am, so I can now put the boat back and then finish loading the food etc into the Prado. We leave home at 12:15 pm but as we drive out of the driveway, Veto (our dog) runs out past us. How the hell did she get out. The side gate is open so the tradies can keep on with the fence painting, but Veto is blocked off on our rear verandah. It looks like she squeezed out past the blockage. We fix this up and head off at 12:15 pm. She is not happy at all. We stop at 1:55 pm at the Mackey Rest Area where we stopped back in 2005 before we lost our wheel. This has been upgraded dramatically since then and is very nice. We have travelled 136 kilometres. We have lunch here and leave just after 2:05 pm. We continue south and leave the Hume south of Goulburn on the Federal Highway. At 3:35 pm we arrive in Canberra and refuel (283 kilometres). We probably do not need to, but we always err on the side of caution. 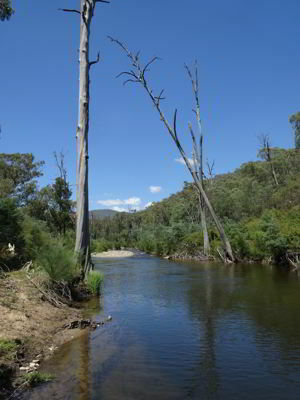 We leave at 3:40 pm and travel via Cotter Dam and Brindabella Road. At 4:50 pm we reach Gentle Annie Trail. This is just past what is called Piccadilly Circus (no sign there but there are distance signs before it). We turn right and head off down the trail. It is 964 metres here and over the next 3.7 kilometres we drop almost 500 metres. We use high range first and second for most of the way, but a couple of steeper spots we use low range. We average 12.9 km/h as we head to Flea Creek Camping Area. This is located (surprise, surprise) on Flea Creek. We arrive 20 minutes later. It is not real big, only space for four groups of about two cars each. 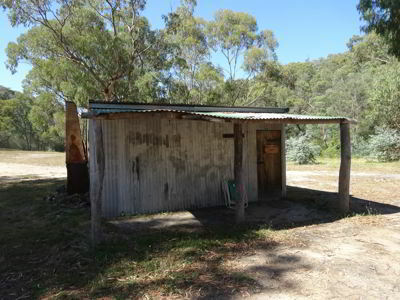 We look each spot and pick one nearer to the toilet block. This looks brand new and is located up a little hill away from the main area. There are four firepits but no tables. 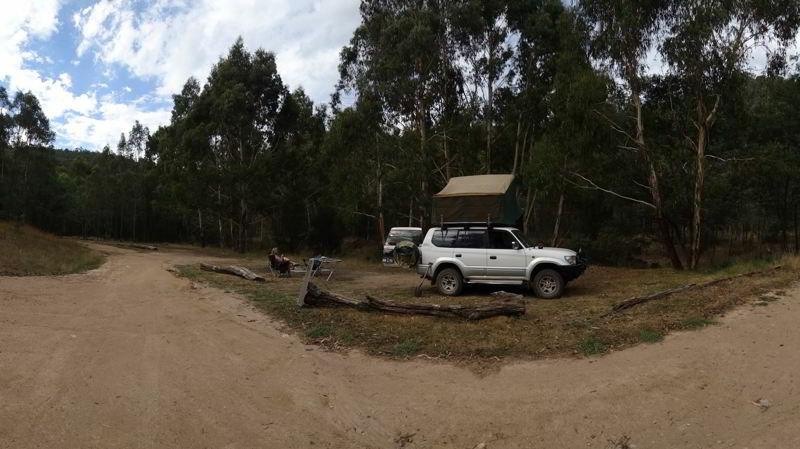 We set up camp and then walk to another one to collect some timber that has been left there. We have drinks and nibblies and then I cook onions, capsicum, sausages and sirlion steaks on our Bijii barbecue while Kelly makes a salad. We are the only ones here till 7:30 pm when two cars arrive and take one of the other spots. We later walk to the picnic area which is across the creek (twice). Wow! This is a much better spot and should be the camping area, although it would need some work. 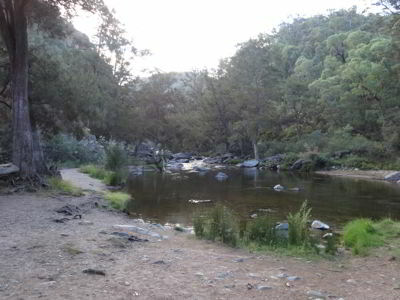 The picnic area is on the intersection of the Goodradigbee River and Flea Creek. The river is widish, with some nice pools. Unfortunately, some idiots have cut down two huge live trees on the edge of the river. National Parks and Wildlife Service have posted some photographs of the trees and a plea for someone to tell them who did it (back in July 2016). There has been a lot of deliberate damage in this park as you will later see. We speak to the two blokes who have camped at the other spot. One is from Canberra and has been coming here since he was young. He tells us about a shortcut to Broken Cart Track in Koscziusko National Park that we will use in two days time. We go back to the camp site and start a fire. There is a nice sunset and we sit around for a while before going to bed at 10 pm. Kelly gets up at 7 am and goes for a walk. She heads further up Gentle Annie Trail, a distance of 2.8 kilometres return but a climb of about 240 metres. I get up at 8 am after listening to the ABC Radio news. I have breakfast and when Kelly comes back, we go for a swim in the river. Nice, not too cold at all, probably about 23ºC. We leave just before 9 am and head up the trail towards the north. This is mostly first and second gear high range, but there is some low range. Just before we get to the Powerline Trail, there is one steeper section that has also been ripped up a bit when it was wet. As it is now dry, it is very powdery and just before the top I have wheel spin in second low. I have to stop and use first to get up. Easy, but harder than the rest of the track. 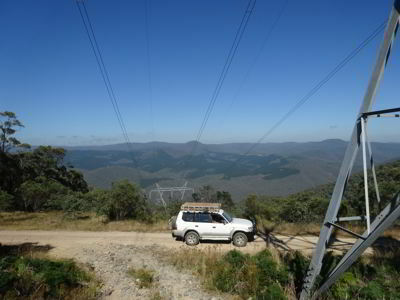 We stop at the high tension powerlines (7 kilometres, 14.7 km/h) which are at 1,075 metres. There are great views to the west and not as good to the east. We continue after a few minutes and arrive at Waterfall Trail 10 minutes later. We turn left and slowly drop altitude as we go along the ridge. After 2.9 kilometres we start a steep descent. Well, I now notice a bit of a problem, the brakes on the Prado are very spongy and I need to pump them a bit as we gone down. They are working, but something is not right. We drop about 550 metres and at McIntyres Trail (17 kilometres from Flea Creek) we turn left again. About 2.7 kilometres on we turn right (still on McIntyres Trail) and go to McIntyre Camping Area which is about 750 metres along the track. 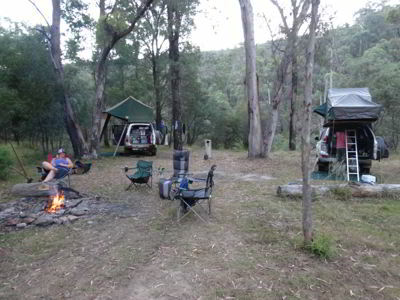 This is a long camping area on the Goodradigbee River. There is only one group of two tents here (no cars). There are some really nice spots. We probably would have camped here but we have made arrangements to meet Ron and Donna at Lowells Flat, so we continue back to the previous intersection where we turn right into Lowells Flat Trail. 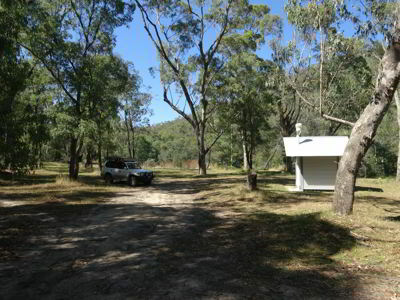 It is 1.8 kilometres to Lowells Flat Camping Area. This is also quite large, not as big as McIntyres, but pretty big. We go up and down and check out the spots. The best two ones are taken by a large group of young blokes and a family. The northern section is closed due to damage to the track and trees. There are more photos put up here by NPWS of damage, including of a tree that some idiots cut a hole through with their chainsaw. How stupid are some people!!! We end up at the southern end and decide to take this spot, even though the access to the river is through a bit of scrub. The river here is good, with some deep sections (another really nice spot only had very shallow rapids). At the moment the actual spot we want to park the car is in full sun, so we park in the shade. 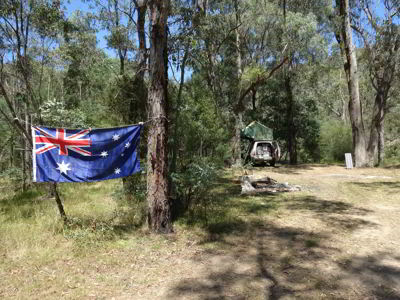 We put out our Australian Flags (since it is Australia Day) and then go for a swim in the river. It is nice and warm, 25ºC according to my thermometer. We have lunch and then another swim. We sit and read and when the sun moves more to the west we put the car in the preferred spot and set up the rooftop tent. Another swim cools us down. Ron and Donna arrive at 3:40 pm, later than we expected. It seems they had visited Ron's son in Canberra on the way down and stayed longer than expected. They set up their roof-top tent. Soon after the NPWS ranger arrives and we have a chat. He sure likes to talk! Turns out he is moving to a new job and his manager is a bloke I have known for 35 plus years and who used to work at Botany Bay NP. After he leaves, we all go for another swim. The water in the river is now 27ºC! It is now drink o'clock and time for sundowners, so we get some beers and nibblies out and have a nice drink and chat. Dinner tonight is mint lamb steaks with salad. I cook the steaks on the Biji barbecue, these are excellent, one of the best ways we have had lamb for a long time (Aldi I believe). After dinner we start a fire as it is now a lot cooler. We sit around it but cannot watch the stars as it is now overcast. We go to bed about 10 pm. Kelly went for a 65 minute walk up the hill at 0640! I got up after 0700 ABC News. While I had breakfast Kelly then had a swim in the cold river. At 0900 we left, at 0935 we reached Webbs Ridge Trail. We had phone coverage here. We left at 0950. At 1037 we went thought Flea Creek Picnic Area. We had morning tea and then left at 1108. We went back to the main road and then headed west. We ended up taking a track under some powerlines that people we met the past few days told us led to where we wanted to go. This was 14 kilometres along the Brindabilla Road and the time was 1140. Another 13 kilometres along this track (which went all over the place), we came to n intersection of Bramina and Boundary Roads (35 minutes). Turning left we followed this and 11 kilometres later (24 minutes) we came to Broken Cart Trail. 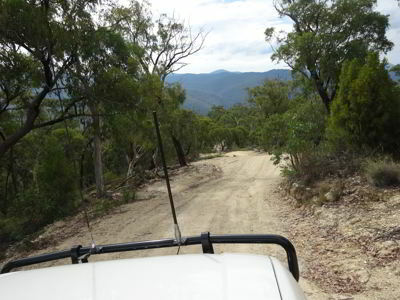 Broken Cart Trail is the main track that leads back south into Kosciusczko National Park.